Bike riding is a fun way to stay in shape. It is also one of the most environmentally friendly forms of transportation. However, biking can be dangerous if your children do not have the right equipment, follow the rules of the road, or keep their bikes well-maintained. There are three things crucial to bike safety. First, have the appropriate equipment and parts. Secondly, follow proper bike etiquette. Lastly, conduct routine maintenance on various parts of your child's bike. When your child rides their bike, make sure to have the right equipment that keeps them safe while riding. They include helmets, headlights, and reflectors. These items will decrease your child's risk of getting into an accident. The first and foremost bike equipment you must purchase is a helmet. Many bike-related deaths involve head injuries, especially brain-related ones. Find a properly-fitting and durable helmet that fits snug on your child's head. Do not get a helmet too big or too small. Only buy helmets that meet Consumer Product Safety Commission (CPSC) standards. Any bike helmet that meets them will have a CPSC sticker. Encourage your children to always wear a helmet while biking. Your child must also wear their helmet the right way, so it can protect them the right way. Their forehead must be covered, and never exposed. An exposed forehead will reduce helmet efficacy. Always make sure their straps are fastened as well. Loose straps can cause their helmet to fall off their head while biking. Make sure the straps are snug enough that they cannot pull or twist. This will also prevent the helmet from falling off. Teach your children the importance of properly wearing a helmet, as it could save their life. While a helmet can prevent injuries, you and your children can prevent an accident from occurring by adding lights to your children's bike. Equip their bikes with a white beam headlight that is visible at a distance of 500 feet and a red rear reflector that is visible at a distance of 600 feet. Both are necessary so your child can be visible from both the front and rear. It also allows them to be visible during low visibility conditions and night time. In addition to lights, your children must be dressed in a manner that allows them to be visible by others on the street. Get them a reflectable vest that is visible from over 500 feet away. You can also purchase an LED safety vest. Wearing these accessories enables them to visible by people on the road after dark. The more visible they are, the less likely they will risk getting into an accident. Your children should also wear bright colors, which will make them more visible. Make sure that you take every necessary precaution to ensure that your children are visible. In addition to having the right equipment, your child needs to learn how to follow the rules of the road. Bike etiquette is crucial because your children will be surrounded by other cyclists, motorists, and pedestrians. It means biking in a manner that prevents dangerous collisions from occurring. It also means being considerate of everyone else on the road. Your child's bike will be treated like any other vehicle on the road, and your child should treat their bikes as such. Teach your children proper bike etiquette, which will allow them to become safe bikers. Rules for motorists also apply to cyclists as well. They must stop at any red light or stop sign while biking on the street. They must also follow road markings and avoid changing lanes frequently. 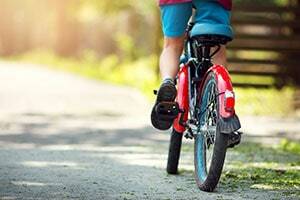 Your child must check their surroundings at all times for other vehicles, especially other bicycles. Yielding to pedestrians is also crucial, as bikes can pose as much of a threat to them as cars. When overtaking any vehicle, bike or car, always pass on the left. By following the rules of the road, you can be confident that your child will bike safely. Safe biking also means biking in a predictable and consistent manner because it allows motorists to keep an eye out for cyclists. Your child must ride with the flow of traffic, and never against it. They must also stay in their lane, and do not weave in and out of traffic. Avoid sidewalk riding, as it can throw cars off guard. Motorists do not expect to see moving traffic on a sidewalk, and your child must pay extra attention when they merge onto a street. Biking in a predictable and consistent manner will ensure the safety of everyone on the road. Teach your kids how to make turn signals, as it allows everyone else in the road to know their course of action. Prior to making a turn, they must always look behind them and then signal safely. To make a left turn signal, your child must stick their left arm out with their fingers extended. To make a right turn signal, they must bend their left elbow 90 degrees with their hands and extended fingers facing upward. To signal that they are slowing down or stopping, have your child bend their elbow downward 90 degrees. Without turn signals, they risk getting into an accident because other vehicles do not know where they are turning. Encourage your child to always stay focused on the road and eliminate any distractions while biking. They must not text and bike as it will take their eyes off the road. They must also not wear headphones while riding, as it can distract them from hearing their surroundings. Always keep an eye out for and avoid road hazards such as potholes, broken glass, gravel, puddles, leaves, and dogs. Avoiding these hazards requires your child's utmost attention. Have them stay focused on the road and nothing else while biking as this ensures their safety. Being a safe biker also means being a competent biker. Have your children practice their biking in a safe and controlled environment away from traffic such as a bike path or an empty parking lot. They must know how to control their steering and braking, to bike effectively on a busy street. By becoming a competent biker, they will be able to control their bike effectively to ensure their safety. A well-kept bike is a safe bike. By conducting routine maintenance on different bike parts, you and your children can be rest assured that it will run smoothly and safely. Teach your children how to take care of their bikes, and have them understand why. Always check to make sure that your children's bikes parts fit tightly. They risk sustaining injuries while biking if parts are loosely connected. Loose handlebars negatively impact steering capabilities. Wheels must also fit tightly as well, as it ensures that your bike moves in a stable manner. You must also conduct maintenance on tires, as a flat tire can increase the risk of an accident. Make sure to keep a tire pump. The best pumps contain a pressure gauge, which ensures an accurate reading. Buy a pump that can inflate to your bike manufacturer's recommended tire pressure. You must also find the right valve that fits on your tubes. Check your tires at least once a week to make sure they are the right pounds per square inch (PSI). Tires lose air over time, and this will affect bike speed and performance. A flat tire will also increase the risk of getting into an accident. Inflate according to the manufacturer's recommended PSI, which can be found on the side of the tire. Make sure chains are well-kept. They are one of the dirtiest parts of a bike, and a dirty chain can cause significant long-term wear which adversely impacts bike performance. Run a bike through its gears to ensure that it can shift gears easily. Apply lubricant on the chain every month, to ensure that it can run smoothly. Never use WD-40, as it can remove grease necessary for a bike to run effectively. Instead, use a lubricant specifically made for bikes. Check the brake pads for wear and tear. Test them by squeezing the handlebars. This ensures that your children can brake safely and effectively. Worn brakes can be hazardous, especially on a busy street where there are significant risks for potential collisions. If they are worn, please replace them before future use. Brake pads are crucial to bike control, which is crucial to safety.